The Big Easy is a peculiar place. Sure, the music scene thrives and the food can satiate any appetite, but Alana and I agreed that there is certainly a pervasive heaviness that hangs over the Vieux Carre. 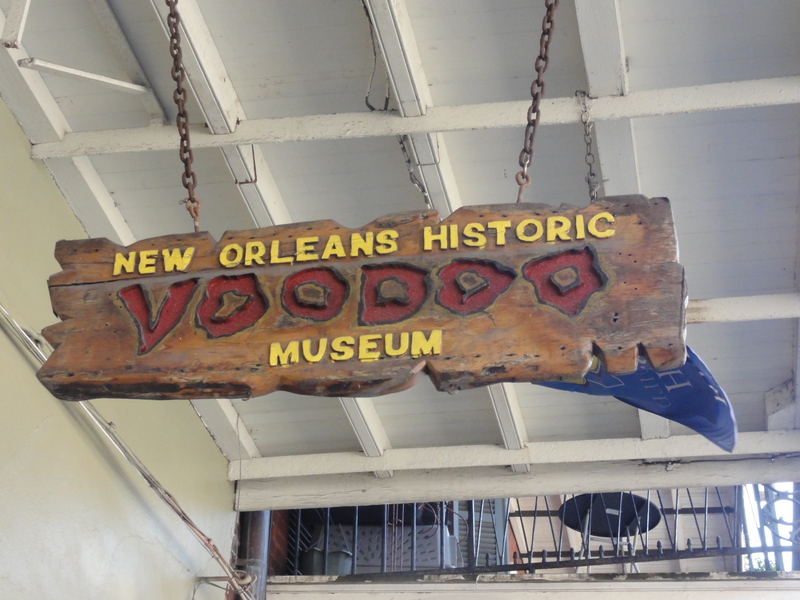 And if the licentious atmosphere of Bourbon Street doesn’t make you feel just a little bit dark, a tour of the city and learning its history just might do it. And in a striking way, it’s something of a paradox. Desperate to see and taste everything New Orleans had to offer, Alana and I drew up a long list of food to try and places to go. In the end, the two-column list appeared to be a strange contrast to itself. 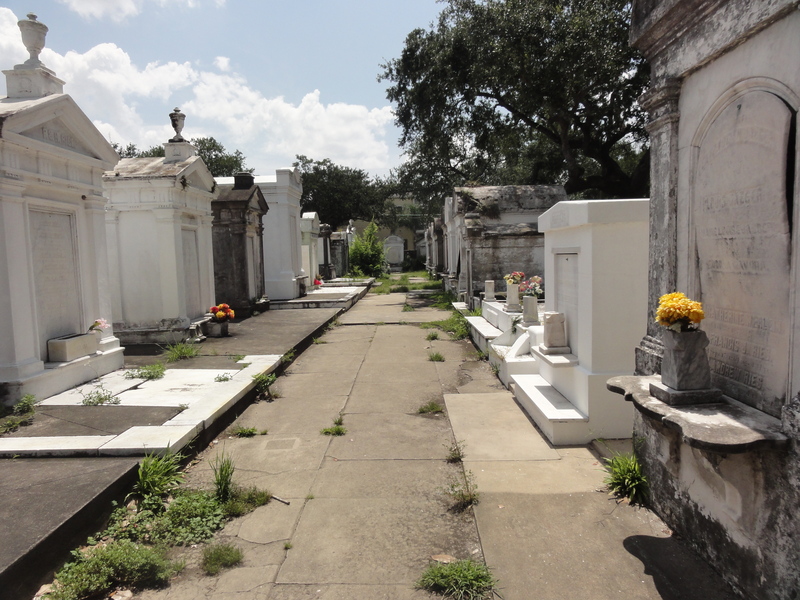 On one side, there were the places we wanted to see, which included Lafayette Cemetery #1 in the Garden District and the Voodoo Museum, just down the road in the French Quarter. In the other column, various food items were scrawled and underlined: gumbo, jumbalaya, po’boys, muffaletta sandwiches, bananas foster. One side was very food-centered, the other very grim. 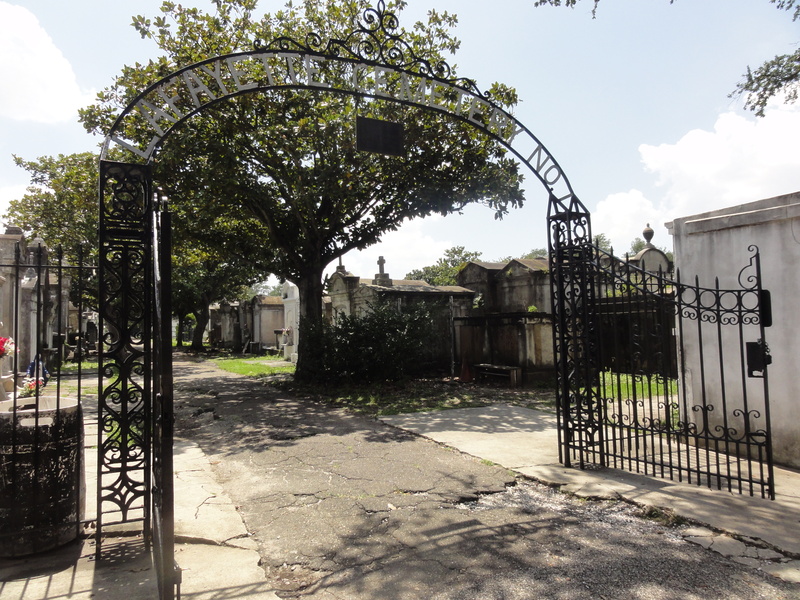 But I don’t think that you can really experience New Orleans without confronting death, and New Orleans has such a unique approach to dying that it’s really worth exploring. The obvious example of this is the aftermath of Hurricane Katrina. According to The Lonely Planet, “disaster tourism” is on the rise, and it’s exactly what it sounds like. People flock to some of New Orleans’ more ravaged districts and survey the lingering effects of Katrina’s damage. While it’s easy to avoid evidence of the disaster, I don’t think it’s something that should be ignored. (The Lonely Planet advocates “Voluntourism,” which combines a visit of the damaged neighborhoods with volunteerism, something I can totally get on board with.) One of the more stark and somber remnants of the hurricane, which we did not get to see, is the “Katrina Graffiti.” There are still some homes standing whose doors bear spraypainted X’s. To paraphrase The Lonely Planet: above the X is the date of the rescue crew’s arrival; on the right side of the X, the crews wrote the number of occupants and their condition (“A ‘0’ meant no one was there, ‘2’ meant two were alive, ‘2D’ meant two were dead.”); on the bottom is the number of animals in the house; on the left, the crews wrote their home states, since many rescuers came from all over the country; finally, the location of the X might indicate where the flood waters were when the house was searched. A bit grim, but a fact not to be ignored. 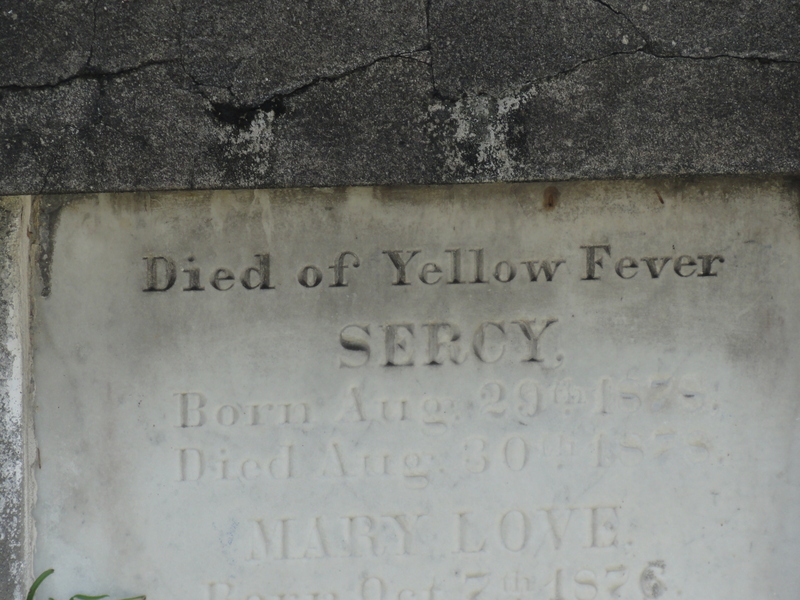 This is part of what makes New Orleans what it is, something entrenched in its history. If anything it underscores the resilience of the people and the assertiveness of the city to persevere. It’s a somber place, inspiring conversation about death and eternal rest and all that jazz. But it’s precisely this that makes me think of New Orleans as something of a palimpsest. There’s this dark layer, but beneath it there’s something luminescent that prevails. Funerals in New Orleans are not supposed to be somber; instead, they’re parades. There’s music, singing, and, well, parading, celebrating the life of the deceased instead of standing around mourning it. And I absolutely love that. I would have loved to have seen a funeral parade, but unfortunately, it wasn’t meant to be. 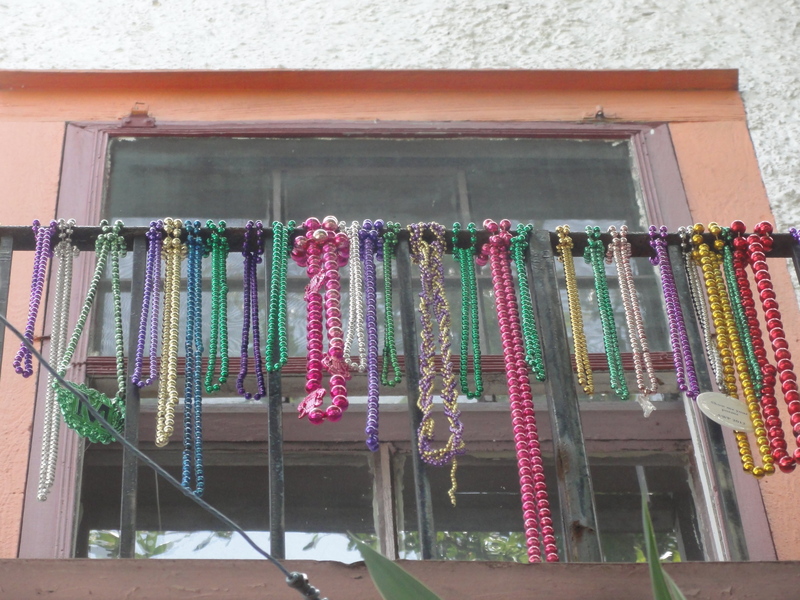 Still, the idea of it makes me love the spirit of New Orleans even more. With all the talk of death and dying, I guess it’s not surprising that vampire literature sprung up here. As Alana and I headed back to the bus station for our next stop, I perused my Lonely Planet. 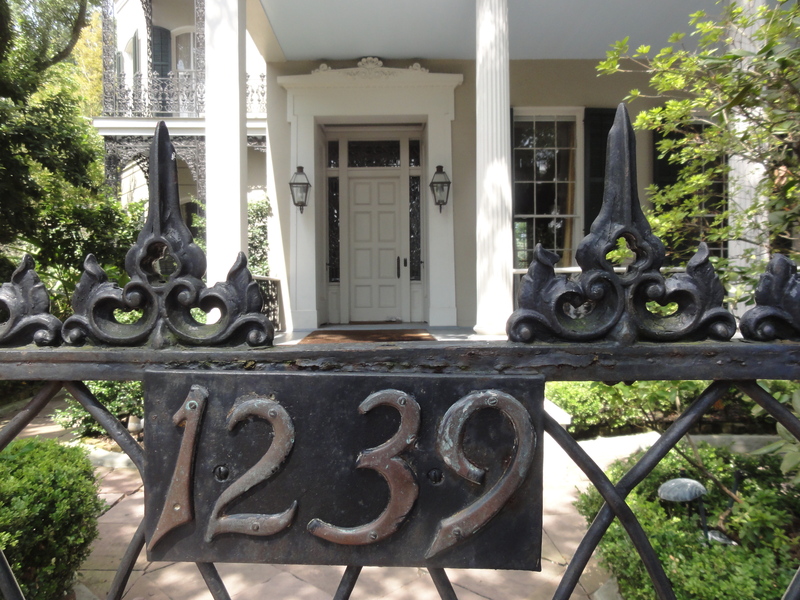 Sure enough, First was just ahead, so we detoured to see the decadent home that once occupied the author of Interview with a Vampire. It was cool. We stood outside the fence staring at it curiously, as if some Boo Radley-type recluse might emerge. Brad Pitt was not inside. 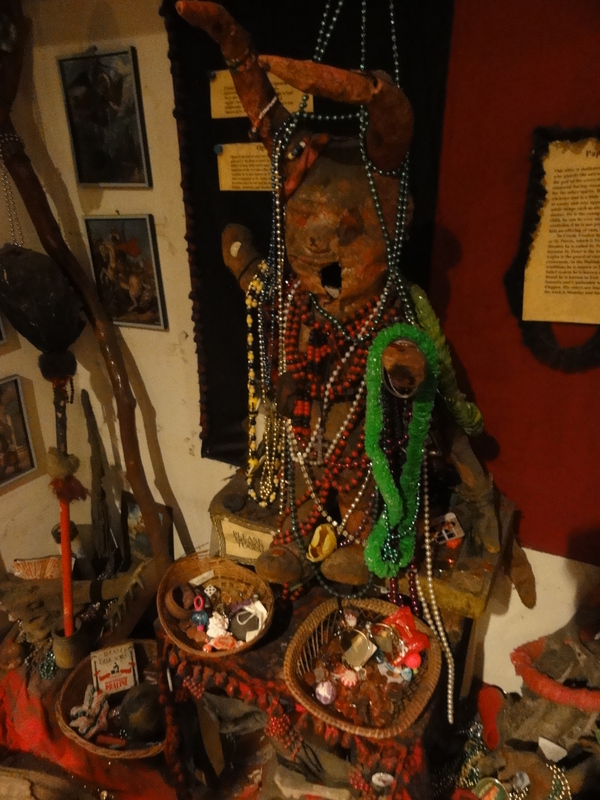 Offerings to a god in the Voodoo museum, including candy and Mardi Gras beads. At this point, we were feeling pretty heavy so it was time to eat. In an effort to cross off the majority of our list, we ordered the following: Sazerac (a uniquely New Orleans cocktail featuring whiskey); Sweet Tea Vodka (just because); a gumbo sampler with seafood, Creole, and tomato gumbo; cornbread glazed with honey and butter; salads; catfish fillet; jumbalya; and crawfish etouffe. And bread pudding for dessert. 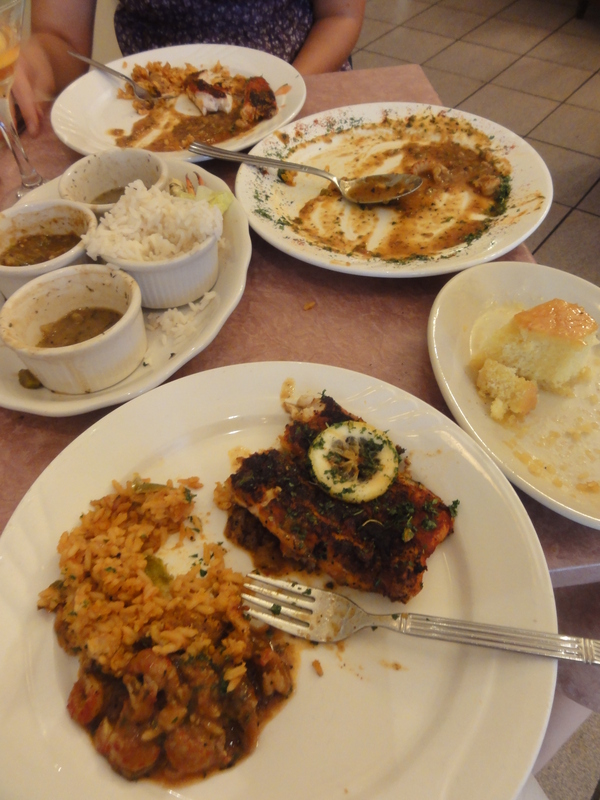 Yes, we ate all of that. 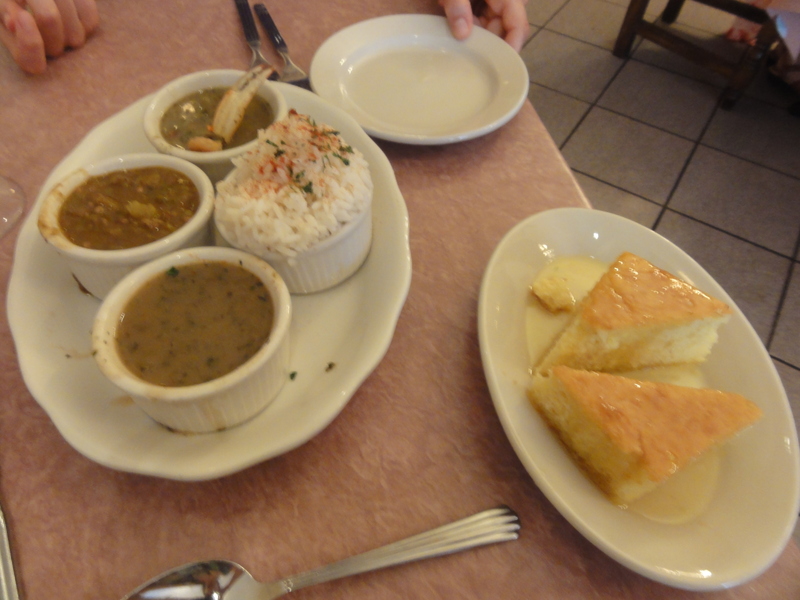 Needless to say, we left the place feeling stuffed and wandered over to Frenchmen Street on foot. We hadn’t even heard of Frenchmen Street before the last night, when we met a woman in the bathroom at Lafitte’s who promised us it would be bursting with tunes. And she was not wrong. d.b.a., the first bar we stumbled into, was in full swing. A jazz band played old time swing music while the patrons, many of whom were skilled dancers, showed off their moves around the floor. It was a humbling experience for someone with two left feet. It took a while, but I ended up dancing with some guy who claimed I had good beat despite me telling him that I was a liability on the dance floor. People poured out into the streets and flocked from one bar to another. We hung around a jazz bar with a possible mute – but stellar dancer – before wandering down the street to another bar where the band played a soulful rendition of C.C. Rider. What I love the most about New Orleans is the roving musicians. You’re at a bar, enjoying the music, when some nomad strolls in with an instrument and asks the band to join in. They’ll set up, play a tune or two, and then be on their way. I love it. We both could have stayed up all night long, sipping mint julips in a cozy corner of some jazz bar on Frenchmen, but sleep was persistent. 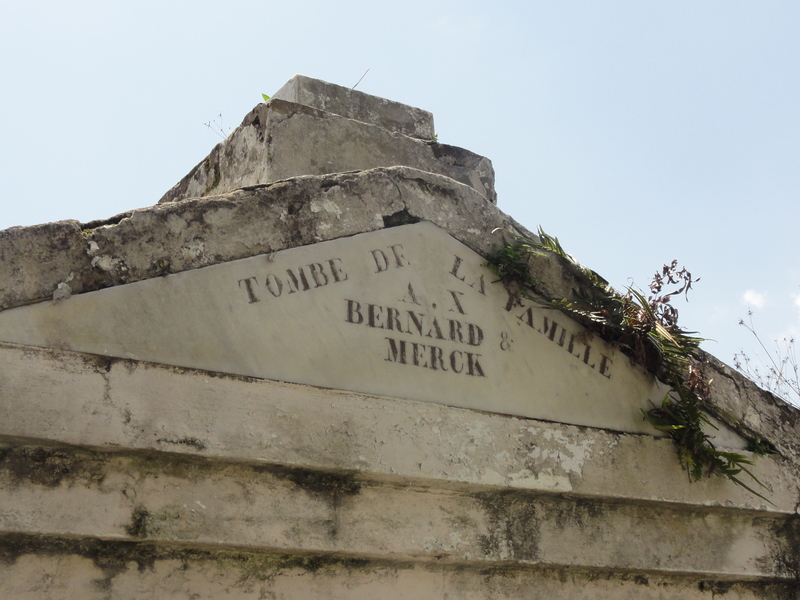 We hopped on a bike taxi back to the Inn where both of us suffered equally from nightmares, possibly Voodoo-inspired. Ending on a happy note with beads! !